In short this is a 40km flat ride that is fast - we have 3-4 groups depending on numbers – the first group averages 40-46kph, the second group holds 36-42kph, third group 32-38kph and the fourth 30-34kph. Riders who come on this ride must be experienced bunch riders. Usual route for this ride is down Charters Towers Road, towards Officeworks, left at Officeworks along Woolcock Street and turn left into Thuringowa Drive, left onto RRR and then right at Nathan Street to go out towards Stuart on University Drive, across the main lights, left at Port Access Road for a very fast sprint along Port Access Road with a regroup at the end and an easy spin into town for Coffee. Note – this ride has a reputation of dropping a few people now and then (who are you kidding – a bit more than a few!!) - The fourth group is a no-drop ride although you are expected to be an experienced rider who can hold 30kph - this ride may also go on different routes (depending on numbers). Experienced women are encouraged to come on these rides. This is our other fast, flat ride – we have 3 groups depending on numbers – the first group averages 40-46kph, the second group holds 36-40kph, third group 32-36kph. Riders who come on this ride must be experienced bunch riders. The route for this ride is down Charters Towers towards Officeworks, left at Officeworks along Woolcock Street and continue down to the overpass at Kalynda, through Kalynda and then left onto RRR to regroup. RRR into the city for coffee, with a hitout at the Chicken Run and regroup at Nathan Street then into town occasionally through the Port Road. This is a drop ride. Experienced women are encouraged to come on these rides. You have had a hard, busy week so come along and join Geoff for an easy 1hour roll from Top Brand down to the Cowboys through Golf Links Drive then back into town along Woolcock Street – coffee in the city at 6am. All welcome. The ride route will change every week – this ride will average around 32-35kph – if you are new to bunch riding please let the group riders know. Although this is a no drop ride please be mindful that the average speed will be around 34kph. As this ride is a solid 2.5-3 hours – don’t forget adequate hydration and food! Children are welcome on these rides, however children under the age of 15 must have parental supervision at all times and stay at the back of the group (they are not allowed into the rotation); children under the age of 17 must have parental supervision until the ride leaders feel that they are competent to ride without the parent in attendance. If you want to bring a child along please contact Top Brand Cycles to discuss. MTB Social ride, meet at Douglas carpark for a 4:15PM start (check our facebook page on the day to confirm time). All very welcome. 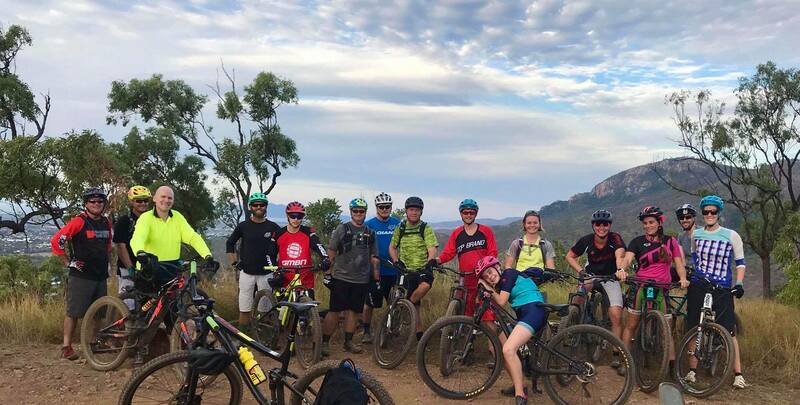 Top Brand Cycles Townsville does not take any responsibility for any mishaps of any kind that may occur to any person or persons when travelling to, from, or when participating in one of the social rides listed on this section or any other section of this website. This is simply an informative service and is not designed to endorse or encourage riders to visit the rides listed above. It is the rider's responsibility to be certain of the legality of any ride or area they ride in, and to take all necessary safety precautions for themselves and others. No responsibility shall be accepted by Top Brand Cycles Townsville, its volunteers or associates, or by the organisers of these rides. Please note: Top Brand Cycles Townsville is an advocate of road safety for cyclists and strictly adheres to the road rules at all times. The law requires cyclists to be visible 50 metres from front and back, therefore cyclists are to supply their own front and rear lights and wear an Australian Standards approved helmet. In participating in any of these group rides, you are taking part in a potentially dangerous activity which could lead to an accident and/or injury. If you participate in any of these rides you do so entirely at your own risk.